The robustness of the constitution of a nation’s polity depends on the robustness of its Constitution. The robustness of the constitution of a nation’s polity depends on the robustness of its Constitution. Can the Constitution of India, conceived to defend the rights and principles of democracy, be used to undermine its own foundations? In the current political scenario, this seems quite possible. The Karnataka crisis has effectively demonstrated that provisions of the Constitution of India that are implicit in intent but not defined in words can be used to impair its spirit. Undoubtedly, the hallowed charter of the Indian republic bestows full powers on the governor of a state to invite any person to form the government after an election, who will be allowed to prove his or her majority on the floor of the House subsequently. In that respect, Karnataka Governor Vajubhai Vala was legally correct when he swore in BJP leader BS Yeddyurappa as the 23d chief minister of Karnataka and gave him 15 days to prove his majority. However, Vala’s decision was at variance with previous gubernatorial decisions in Goa, Meghalaya and Manipur, where the largest single party was ignored in favour of post-poll alliances formed by the BJP. Now, non-aligned Constitutional experts are wondering whether the fathers of the Constitution had ever envisioned the interpretation of constitutional provisions being left to an individual in Raj Bhavan rather than the institution itself. Vala’s decision has reopened the controversy surrounding the role of governors in Indian democracy. The great freedom fighters who formed the Constituent Assembly failed to anticipate the misuse of institutions that followed. Neither did they define the powers of each and every Constitutional authority, from the president of India to the Chief Election Commissioner, as each one of them has interpreted the Constitution according to his wisdom in the absence of a cast iron framework specifying their powers. For the past seventy years, Indian’s democracy’s sacred charter has been at the mercy of power-hungry political leaders for inflicting constitutional illegalities on the nation. The Indian Constitution is a document which guarantees the fundamental rights of the people. It has laid out a robust mechanism of checks and balances which mandates the executive, judiciary and the legislature to keep themselves within the confines of their respective domains. Yet all the three have used the same mechanisms as an arsenal to diminish and demolish each other. Last week, it was left to the Supreme Court to define the powers of the governor. Though it has given numerous verdicts on the dismissal of state governments, it is yet to pronounce the final view on the selection of chief ministers in ambiguous situations. While advancing the date of Yeddyurappa’s floor test, the three-member bench also decided to look into the legality of the governor’s order of inviting the largest single party to form the government. This is not the first time the governor of a state has been in the eye of a storm. So far, many governors have come under attack for unjustified dismissal of duly elected governments, but never for the appointment of a chief minister. Since governors are appointed by the ruling party at the Centre, they have often been at conflict with state governments that are opposed to the Centre. Moreover, the Constitution does not mention the qualifications for a person to be appointed as governor. During debates over the choice of governors, the legendary former home minister, Vallabhbhai Patel, had made it abundantly clear that their “special powers” wouldn’t place them in conflict with duly elected state governments, and these “powers” would be limited to sending a report to the President when “a grave emergency arose, threatening menace to peace and tranquillity”. There was also the suggestion that the governor be directly elected by the state’s electorate. It was turned down because Jawaharlal Nehru argued that such a move would close the door on the appointment of academics and distinguished people in other fields to contribute to public life. But years later, it was Nehru’s own Congress party that set the ground rules for the misuse of gubernatorial powers to protect its political interests. On July 31, 1959, Kerala Governor Burgula Ramakrishna Rao dismissed India’s first Communist state government led by EMS Namboodiripad. In 1957, it had won 60 of 127 seats and formed the government with the support of five independents. However, both Nehru and daughter Indira Gandhi could not digest the Communists’ victory. The Congress used every trick in the book to dislodge the Kerala government. Finally, the party managed to combine all the anti-Communist forces and launched the ‘Vimochana Samaram’ (liberation movement), which led to a massive law and order problem. Prime Minister Nehru, on the advice of the governor, invoked Article 356 and imposed President’s rule on the state—a first since Independence. Since then, Home Ministry data show, governors in various states have been used 115 times from 1951 to 2016 to dismiss duly elected governments on one pretext or the other, recommending the imposition of President’s rule under Article 356. Twelve state governments were dismissed in 1977 after the Janata Party came to power. In 1980, after Indira Gandhi’s victory, the Centre used governors to place nine states under President’s rule. Raj Bhavans are ritually packed not by eminent academics as Nehru envisaged, but by a community of groupies comprising ageing but loyal politicians who have lost elections, former babus, judges, police officers or service personnel who have been useful to the ruling party while in office, caste or community satraps and personal loyalists. 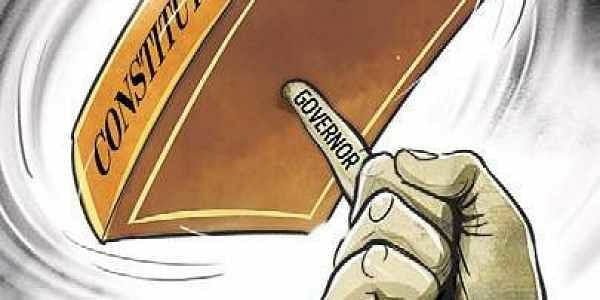 Of the 30 odd governors and Lt Governors, more than 50 per cent have been drawn from political ranks; each one of them hand-picked to serve the agenda of the party in power at the Centre. Though the institution of the governor was introduced in the Constitution to protect genuine federalism and to ward off territorial threats to the stability of the Union, it has been used more often to secure the interests of the governing party. Since politically motivated governors pose an ominous threat to the concept of federalism, the time has to come to define their powers by amending the Constitution. Ideally, retired, tired or fired politicians and officials should be kept away from Raj Bhavans. If individuals are allowed to inflict irreparable damage to institutions, it would pave the way for the collapse of Indian democracy before it acquires credible maturity. Change to American system wherein all politicians are directly elected. Governors (Call them CMs) should be directly elected by entire state. As exeutive head he can select eminent people in different fields or even eminent politicians with subject knowledge as his secretaries. Legislature will make laws and bills. PM is laso directly elected by the entire country. Elections will be held for all over the country on a single day like the first tuesday o November as in US. Even Judges will be elected by people. The best option is to appoint retired armed officers who don't have personal ambitions as and keep the interests of the country and follow the regulations. It cannot be said to all civil servants who have served their political masters.